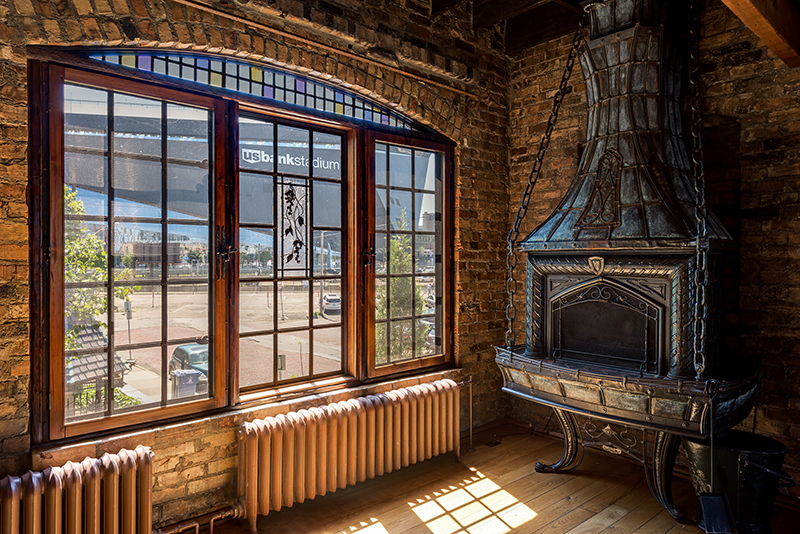 An urban castle in downtown Minneapolis has the Muggle world intrigued. “It’s kind of gone viral nationally — even as far as London — with references to it being the ‘Harry Potter House,’” says Coldwell Banker Burnet’s Jeffrey Dewing, the listing agent for the 4,547-square-foot home. Just steps across the light rail line from the US Bank stadium, this ivy-walled property is the only single-family home within a 12-block radius. It’s in walking distance of restaurants, shopping, and great city parks. But central location is only the beginning of its charm. 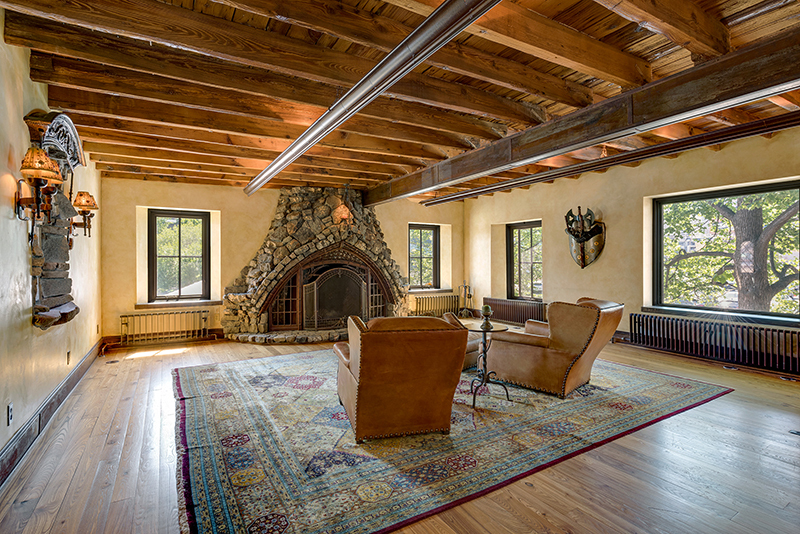 Built in 1911, this property has a long, storied history. “At the turn of the century it was a blacksmith shop,” notes Dewing. “After that, it was used for a few different commercial uses,” he continues. “One of those was an electric company called Flash.” On one of the building’s outer walls, you can just make out a decades-old painted advertisement from when the building was home to Flash Electric Company. In the early 1980s, Sage and John Cowle converted the building into a residential and dance studio space, at the beginning of the revitalization of the Mississippi River waterfront in downtown. 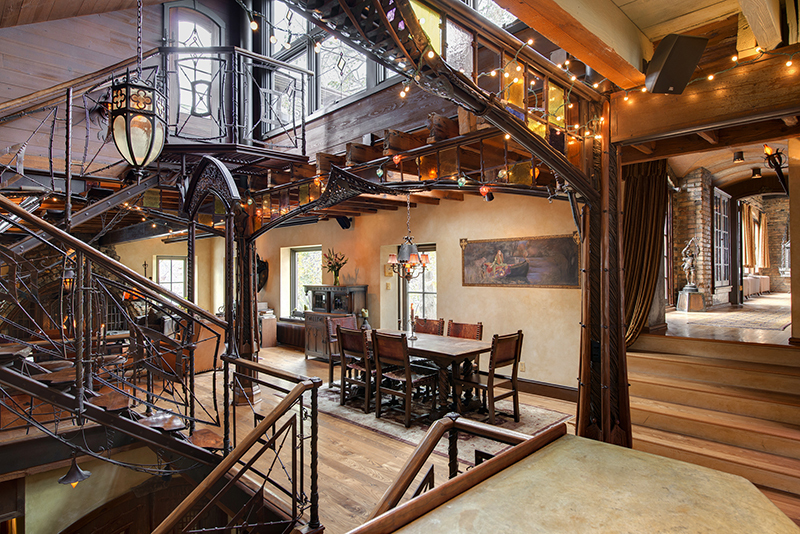 The Cowle family sold the building in 2002 to musician and restaurateur Jeff Arundel, whose extensive renovations have given it today’s whimsical castle look. “It’s one of those houses that every time you go to it you notice some new and unique detail,” Dewing says. 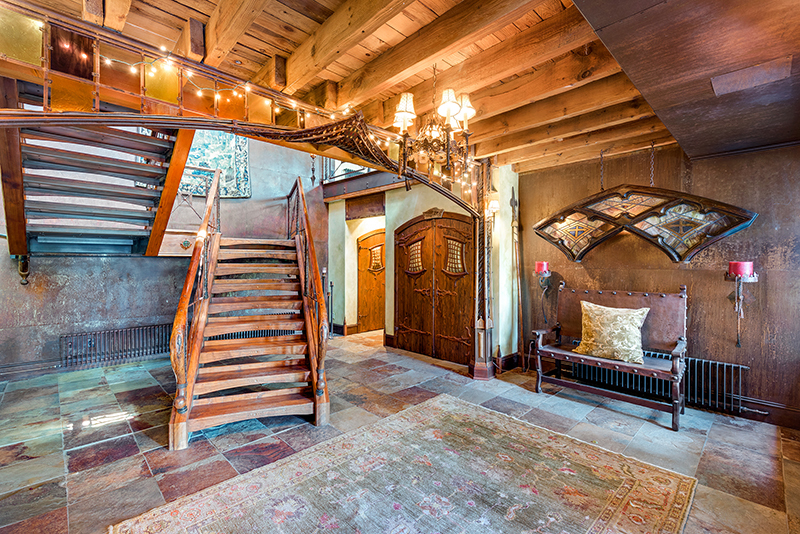 Some of the enchanting fixtures include an elaborate central wrought-iron staircase, stained-glass inset arches, a flagstone foyer, and rustic fireplaces in the living room and master bedroom. 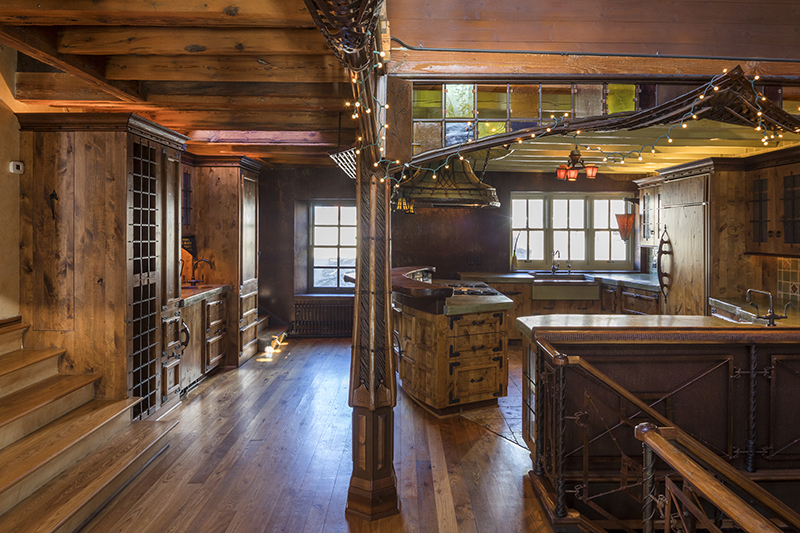 “Paul Tierney, who’s local in Minneapolis, made all of the metal work by hand,” says Dewing. Every detail show’s an artist’s personal touch: Several carved faces peep out from the home’s intricate fixtures. 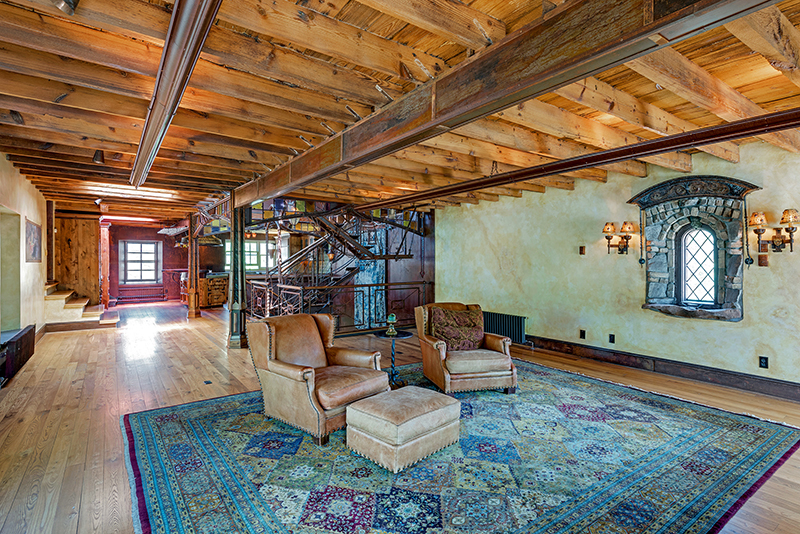 A wooden face beams down from the staircase, and a metal face and hands point out from a downspout on the roof. An iron dragon sculpture keeps watch from the turret-topped entrance gate, as if waiting for a secret password. 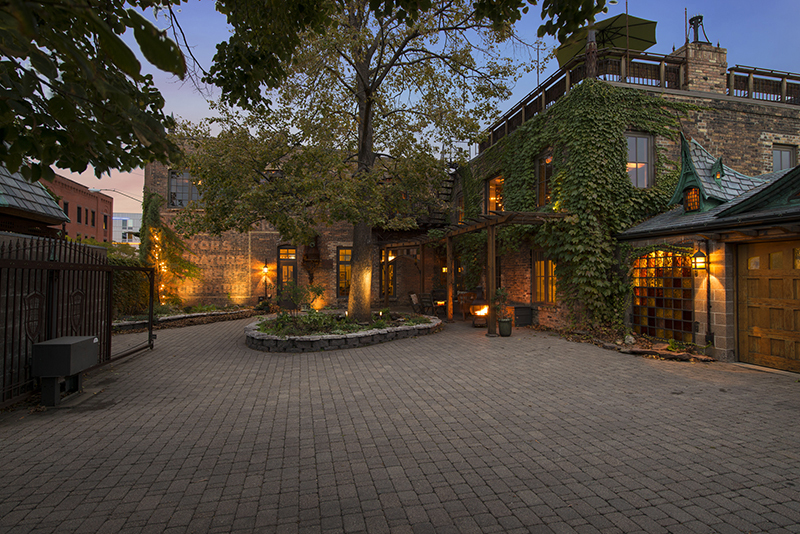 “One of the things that’s wonderful about the property is all the outdoor space,” says Dewing. Inside the cobblestone courtyard, a large mature tree shades the plantings below, and a porch juts out from the building to make space for a sitting area. The building’s roof deck affords great views of sunsets and the skyline. There’s ample room for patio furniture — possibly even an owlery. A window-lined first-floor hallway connects the house to a two-car garage. The kitchen boasts custom cabinets, and an island with bar-height counter, for mixing the most elaborate potions with ease. The master bathroom’s deep green tilework serves as the perfect backdrop for a relaxing shower, or puzzling out a mysterious cipher. Though it has served for years as a residence, this property also has great commercial potential, for the enterprising witch or wizard. Earlier this year, the property had been in talks to be purchased and made a brewery and taphouse. Even in current showings, the interest has been almost an even split between residential, mixed use, and commercial. “People have looked at it as a restaurant space, a wine bar, and a commercial office space,” says Dewing. This incredible urban castle is just waiting for the right people to harness its magic.